We’re only days away from the greatest game of the season. Plenty of experts and amateurs will tell you what each team needs to do in order to hoist the Lombardi Trophy in New Orleans on Sunday night. 1)Pressure Joe Flacco. Flacco has done well against pressure, but the main objective is to make fullback Vontae Leach and tight end Dennis Pitta be Flacco’s check-down receivers, and make Ray Rice stay in pass protection. Rice is without question the most dangerous weapon for Flacco, and is sure to be a focal point in the Ravens offensive game plan. Making Rice a pass blocker to prevent sacks is a worthy sacrifice for both teams. Patrick Willis, Navarro Bowman, and Dante Whitner will do a good job in coverage against Leach and Pitta, as the 49ers have the speed and coverage advantage. Against Rice, those same 49ers will have a tougher challenge in the open field. 2)Exploit the Tight Ends. By making Flacco check down to Pitta and Ed Dickson, the 49ers defense is daring Flacco to throw it deep against aggressive man coverage. By allowing Pitta and Dickson to be successful early, they can lure Flacco into a false sense of security and allow the window to open for errors. Wide Receivers Torrey Smith and Anquan Boldin are dangerous, especially against man coverage. However, the 49ers safeties Dashawn Goldson and Dante Whitner will be able to play a deep zone coverage increasing the chances of coming up with an interception. It will be up to Willis and Bowman to limit Pitta and Dickson to short yards, and no yards within the red zone. On the offensive side of the ball, Vernon Davis had a huge day against the Falcons, and Delanie Walker recovered from multiple drops against the Packers. Davis and Walker are heavy mis-matches that the Ravens will only be able to combat by making Bernard Pollard assist in coverage with the Ravens run focused linebackers. Expect a big day from the tight ends, and more open field for the wide receivers later in the game. 3)Do NOT Settle for Field Goals. We all know this title game will be a close one. These two teams match up very well in all areas except for kickers. Both teams cut ties with Billy Cundiff this year because they believed that Justin Tucker and David Akers are better. Since Akers has had what he has called a “head-scratcher” of a season, do not let the game fall onto his shoulders. He’s already missed a field goal in the playoffs that he easily should have made. Touchdowns are the only way to go. Against a team like the Ravens, a missed or blocked field goal will only fire them up and bring new life to their sideline, and deplete it from the 49ers. 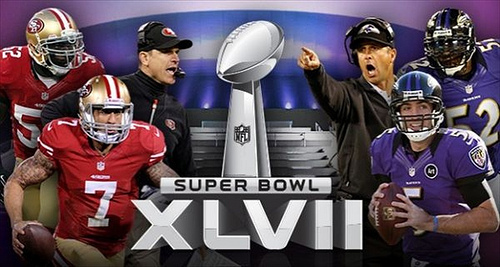 Despite the 49ers being favored, many football fans believe the Ravens can pull this victory off. Momentum and emotion does carry a lot of weight, especially in the playoffs. Just ask the Packers and Giants. However, a team that runs on emotion is easy to exploit when their opponents play strong, fundamental football. That is exactly what the 49ers are all about. The Ravens proved that talent supersedes emotion by knocking off the Indianapolis Colts in the Wild Card round. We’ll see if the 49ers can prove that guts will only go so far in the hunt for the Lombardi Trophy.